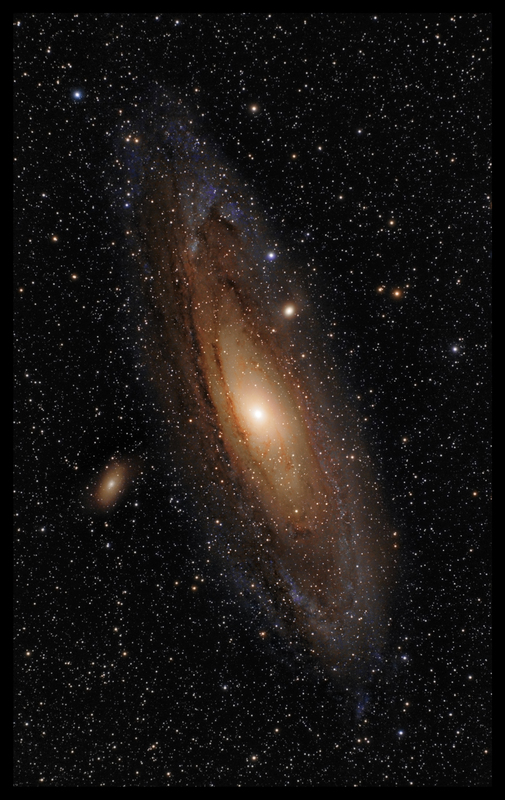 Even people without any real knowledge of astronomy have heard of 'The Andromeda Galaxy'. It has many designations....M31 and NGC224 are a couple of the duller ones, but it also goes by the title of 'The Great Spiral in Andromeda', a much more fitting name for the closest spiral galaxy to us. At 2.5 million light years, it's just a stone's throw away in galactic terms. It is now thought to contain about a trillion suns, at least double of the amount contained by the Milky Way galaxy, and is the largest member of our local group of about 30 smaller galaxies. However, it appears to be less massive than the milky way, as we have more dark matter, so appearances can be deceptive! With a visual magnitude of 3.4, it's not hard to spot with the naked eye from a reasonably dark site without the moon around. As it's light has taken 2.5 million years to get here, it means that we are now seeing it as it was in the Lower Paleolithic period on Earth...the Dawn of Man. The first evidence of stone tools is from then. If you remember the beginning of 2001, A Space Oddyesy, that's when we're talking about. Some images come together almost immediately, and others seem to be sent to test your resolve, and this is one of those!! In fact, M31, together with the Rosette, have been my Nemeses!! I got lots of data on this, from home and from Kelling in September, but had an awful time with different gradients.....anyway, I kepyt bashing away and it finally cracked. A big help was the DBE function in Pixinsight, plus some cropping to get rid of the worst areas. Imaged in September 2011 with a TMB 80/480, SX M25C camera and Televue TRF2008 focal reducer. Mount was an HEQ5, guided with a Willam Optics ZS80FD and Lodestar. 53 x 15 minute subs....total imaging time, 13 hrs 25 minutes.